Fill ‘er up with bike-related local news stories and letters to the editor, etc. In the third settlement, the city would pay $50,000 to Victoria Rainey of Manchester, who alleged the city was negligent in failing to maintain a sidewalk outside the Phipps Conservatory in Oakland. 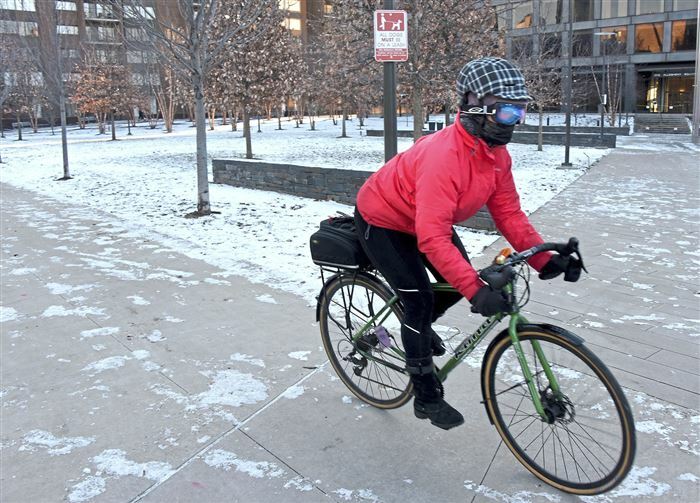 PG has a poll today asking if you think bike lanes should be plowed. So far, 49% said yes, 40% no, with remainder having no opinion. Sometimes (always?) Those polls are clickbait for you to answer other survey questions that the PG makes $$ off of. @edronline, oh, I know. Today’s follow-up questions concerned apps for ordering take-out. Don’t people cook at home? Jeez. MILLVALE, Pa. – Police in Millvale have released surveillance video of a hit-and-run that seriously hurt a veteran in hopes of finding the driver. Police released the video Thursday because they’ve been looking for the driver for months and can’t find her, hoping someone will recognize the car and turn her in. “Initially it was like, ‘You gotta be kidding me. Did I just get hit by a car? '” said Thomas Bricker. He is the bicyclist in surveillance video who can be seen coming down Grant Street in Millvale when he gets run over by a car. Thomas has been in physical therapy for a dislocated shoulder ever since the incident that happened on Oct. 26. Police tried for months to find the female driver, but couldn’t, and that’s why they just released the surveillance video to Channel 11. Bricker, who was in the Marine Corps for five years, still can’t understand how the driver could just hit him and leave. “Thank God I was wearing my helmet, I don’t know what would’ve happened then,” he said. There is a possible reward for information leading to a suspect and conviction. The driver will be charged with leaving the scene of an accident, reckless endangerment and aggravated assault. The letter-to-the-editor titled “Cyclists also have a share in the culture of impunity” argues that “the city’s promotion of cycling has come without any obvious enforcement mechanism such as those applying to motor vehicles and has put pedestrians at increased risk”. Did the writer say “increased” when he meant “reduced”? No charges to be filed in the road-rage incident discussed here. Nobody’s filed a report with the police. Here’s a real doozy in the trib. so much straight up wrong. Whenever I read that the parkway is going to be under construction I think – good thing there’s an awesome bike trail right next to it! Unfortunate though that a bunch of work is being done to 837 and no pedestrian/cycling improvements are planned (outside of the south side). Due to it’s proximity to the GAP trail, it would be great to have that road be more friendly so that locals can safely get from their homes to the trail. Since there are many low-income neighborhoods throughout the corridor, they would greatly benefit from increased pedestrian and cycling safety which would allow people to get to work more safely. It would also likely help the neighborhoods improve long-term. In many areas 837 it is a high-speed corridor and really doesn’t need to be. This reply was modified 1 year, 1 month ago by Bree33. JuJu Smith-Schuster and his bike is now a bobblehead. It does appear that as they get input from their community meetings, they are updating the map to reflect that feedback. I’ve seen a couple stations move around on the map. Where exactly is this railing being placed? I couldn’t figure it out from the trib article and I’m trying not to use up my PG articles. It must be on the western (downtown) side of the bridge. It says the bike lane will be used for the detour. I think the sidewalk is unprotected, so there will be some kind of railing to keep people from accidentally stepping into the road. The parapets are getting modified with railing extensions to make then at least 42″ high, I believe on all quadrants. Upcoming parking changes/construction on Smallman.